What type of ring does the world’s most eligible bachelor present to his fiancée on bended knee? George Clooney proposed to Amal Alamuddin with an elegant 7 carat emerald cut diamond engagement ring set in platinum. Now you can propose like a celebrity without the celebrity bank account. 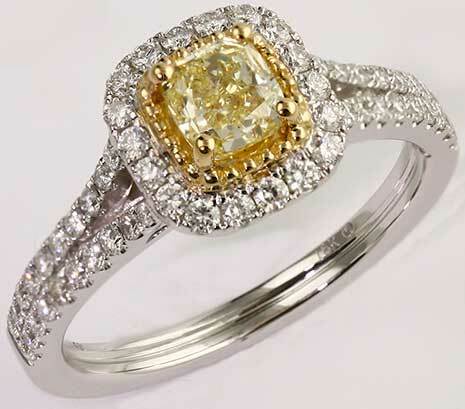 Consider this beautiful engagement ring by Gottlieb and Sons for your one and only. Rare beauty is exemplified in this 18K two tone engagement setting, with diamonds shared prong set along split shoulders, meeting a diamond cushion shape halo. An inner yellow-gold beaded halo accentuates a stunning ½ carat fancy yellow cushion cut diamond, held by yellow gold prongs, further complimenting the rare stone. Visit one of our local retailers to see how you can make all her dreams come true.